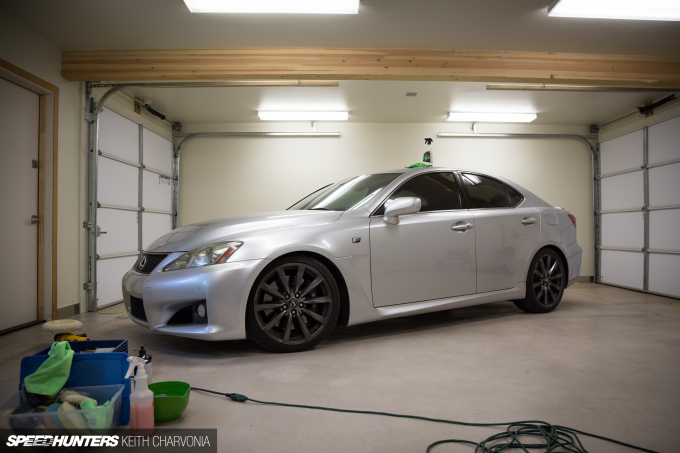 As I mentioned in a quick Random Snap story back in May, I recently traded my pumped-up Subaru Impreza STI sedan for a 2008 Lexus IS F. On paper the values were equal, despite the F being a few years older and having a few more miles too. I didn’t mind though, because any Toyota/Lexus owner will tell you that 62,000 miles is hardly broken in. Long story short, I just didn’t have the stomach for a Subaru that seemed to break if you looked at it wrong. I had reasoned that since it was built with forged internals and quality aftermarket parts that it must be indestructible, but I wound up eating humble pie on that one. 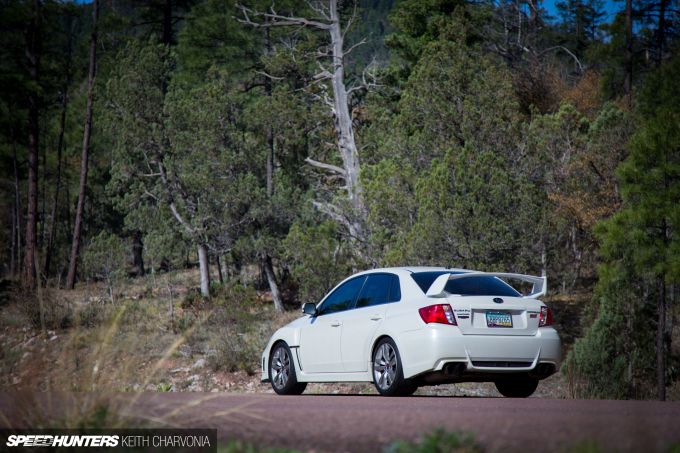 The flip side would be going back to my Toyota roots, but what could I possibly find in the Toyota lineup that would match the excitement of an STI and still give me the reliability I demanded? I looked right past the IS F, assuming they were out of my price range, and right to the much older IS300 with dreams of turbocharging the 2JZ-GE. I scoured classifieds nationwide for the perfect Sportcross wagon and began researching turbo kits. Then one day I got an email from the owner of the IS F that’s now mine. He loved my STI, but would have to sell his car first to buy it. We started talking and soon realized that a straight trade would be a good deal for both of us. What ensued turned out to be a very fun trip to make the trade. 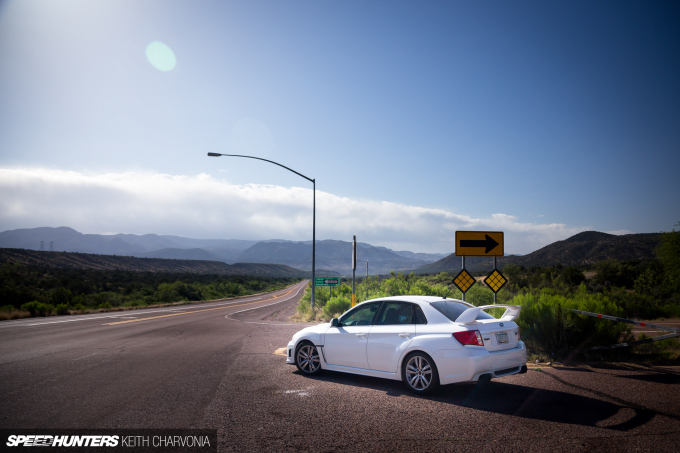 The IS F owner lived in Albuquerque, New Mexico, so the east part of Arizona would be a perfect spot to meet. 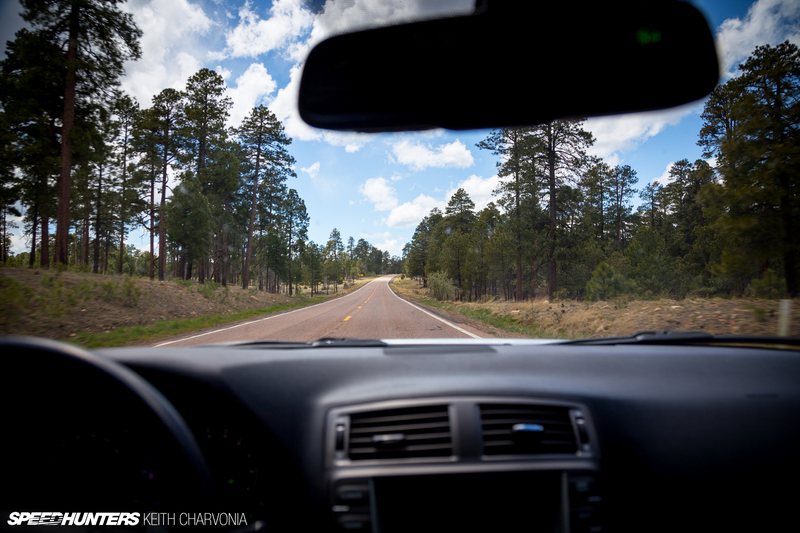 This route took me through my favorite part of the state, where you quickly climb the Mogollon Rim into cooler weather and dense pine forest. I pulled over a couple times to get my last photos of the STI. With a full tank of E85 and the high boost tune, I really was having a blast delivering the Subie to its new owner. 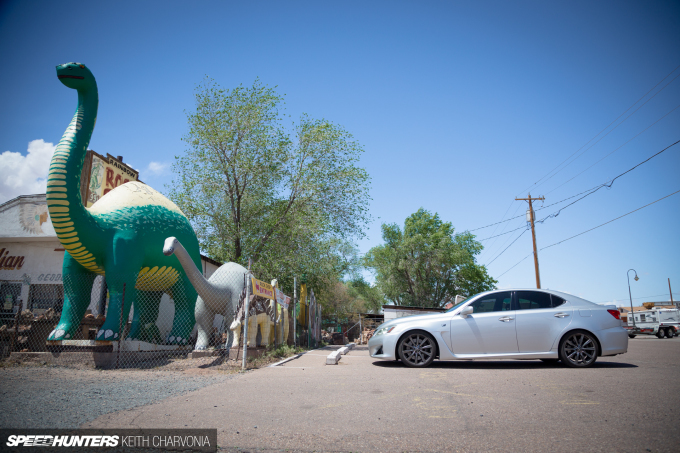 We met up in the small town of Holbrook, Arizona, exactly three hours from home for each of us. It was the perfect day to play hooky from work and do car stuff instead. We carefully looked over each car and went on test drives, looked them over again, then decided to do it. The week before we both had pre-purchase inspections performed as well, along with countless pictures, emails and a Facetime meeting to walk through both cars. Our minds were made up. Back to my decision to trade the exhilarating ride of a tuned Subaru for a vanilla Lexus for a second though. Was I willing to give up the excitement for the peace of mind of owning a Toyota again? Sure, a Lexus can break too, but I’ve had a stellar track record with Toyota products over the years and I simply love them. You’ll hear people say that Toyotas lack soul though, and I suppose that’s the trade off for superior engineering and durability. On my drive home I would have more time to see how I liked the new IS F, because a short test drive really isn’t enough to make that judgement. I blasted back down the Rim, settling into my new ride. It was just as a Lexus should be, smooth and comfortable, even with the lowered Swift springs and uprated lower control arm bushings. Pretty good. Then I turned on Sport mode and shifted into manual and the car came alive. It truly is a two-faced car, mellow when you don’t want to race around, but more than ready to go when you call upon the 416 horsepower and quick-shifting 8-speed transmission. Had I just traded for a soulless Toyota? Hardly. ‘Yeah, this is going to work out just fine,’ I thought to myself. After mulling over several names for the project a close friend suggested ‘FujiSpeed’, referencing Fuji Speedway where Lexus developed the car and where many consider to be the spiritual home of the F marque. 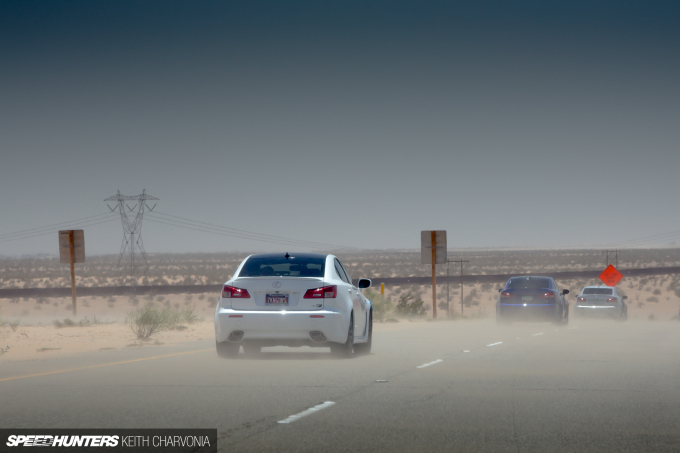 Of course, ‘Speed’ brings to mind Speedhunters too. I mentioned building a new shop for Charvonia Design in my latest Trailhunter FJ60 build series post, and as you see here the space wasn’t even complete when I brought FujiSpeed home. My good friend Colin Stevens of Elite Auto Creations had heard about my new car and offered to swing by and buff out a few nagging scratches. There’s something about this silver that really makes flaws show even if they’re not all that bad. This was only 1500 or 2000 grit sandpaper, but the sanding required would still make most men cringe. It has to look worse before it gets better though, so Colin cut into the clear to flatten out the scratches. With some polishing compound and a high speed buffer the paint shined right back up. 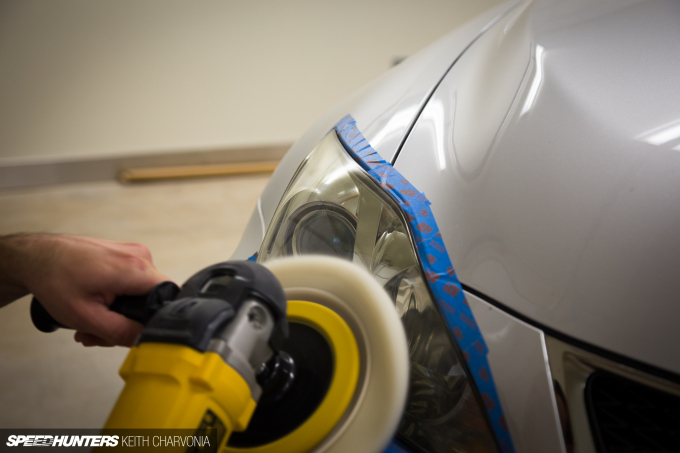 You might remember Elite as the shop that performed a full color change on our Scion Tuner Challenge-winning FR-S. 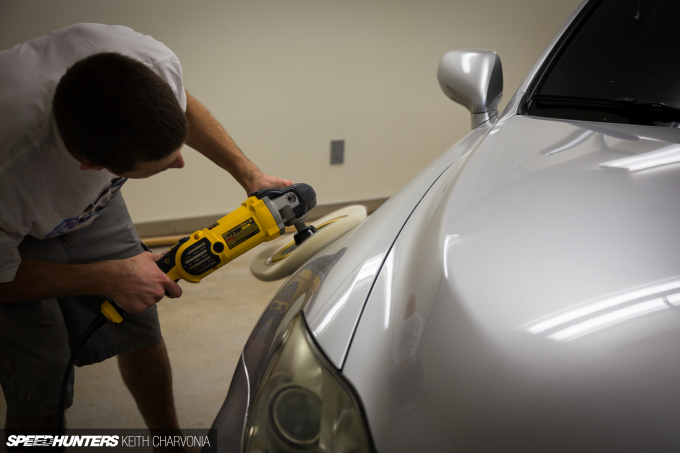 The headlights were looking hazy, so we thought we would buff those out as well. Notice the tape on the painted edges to keep the buffer from burning through. 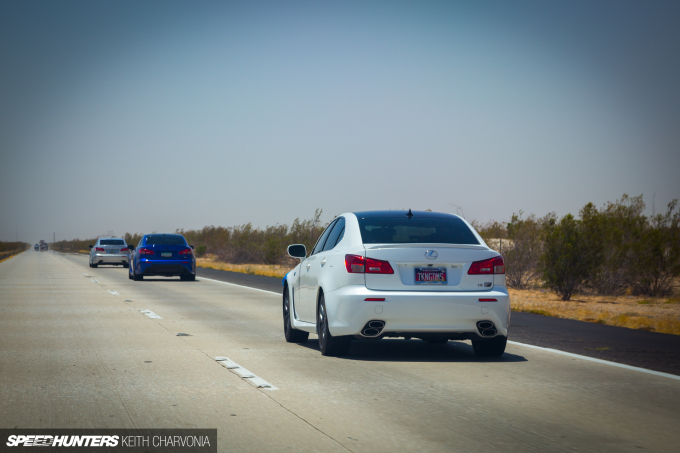 Not long after I acquired my F, I found a great Arizona Lexus owners group on Facebook. 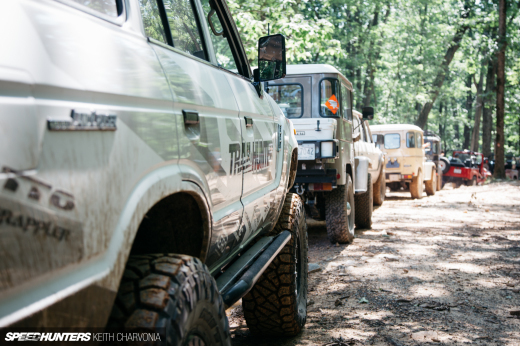 I didn’t realize that there were several like-minded individuals in my area. 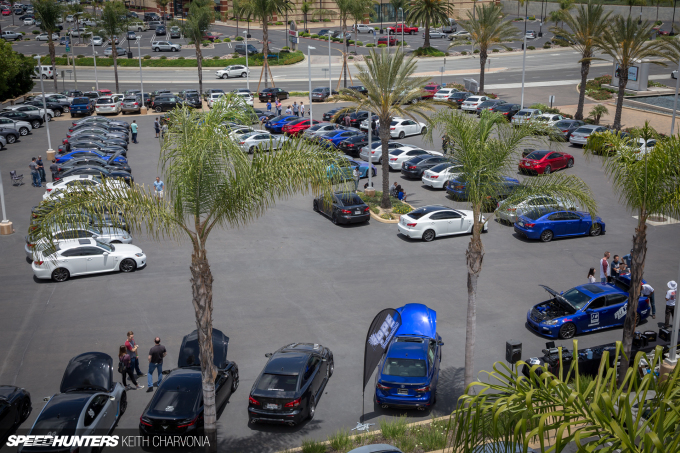 Just a few weeks later there was an F-only Meet in Escondido, California, so a group of us decided to caravan out there. I figured the meet would provide a perfect opportunity to decide what I wanted to do to my car. The two main things I planned to study were exhaust sounds and wheel and tire fitments. 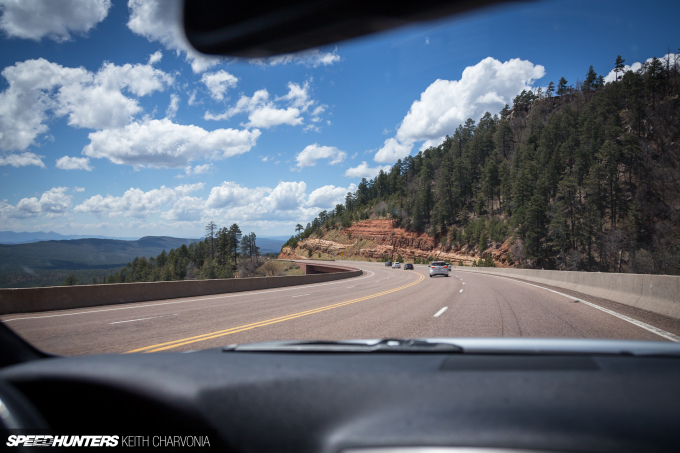 I got a good sampling of exhaust notes on the ride out there with the AZ crew. 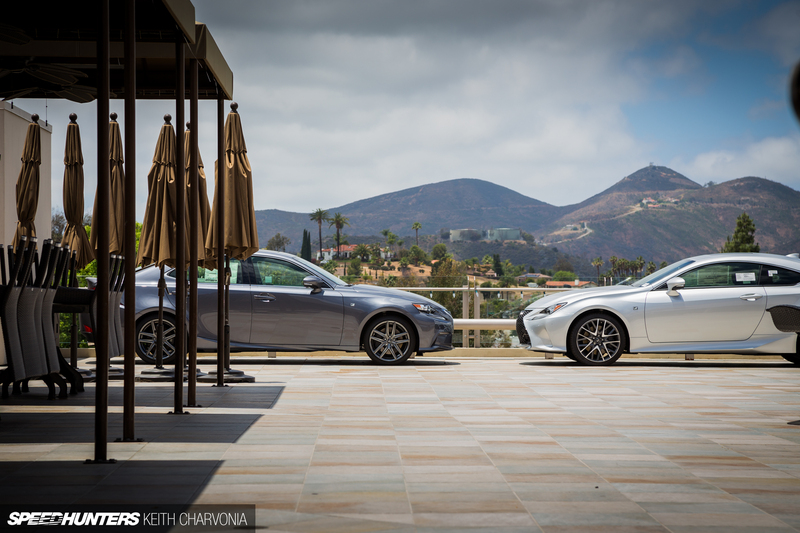 We enjoyed the much cooler weather in Southern California and parked up at Escondido Lexus, one of the nicest dealerships I’ve seen and host to our group of enthusiasts for the day. 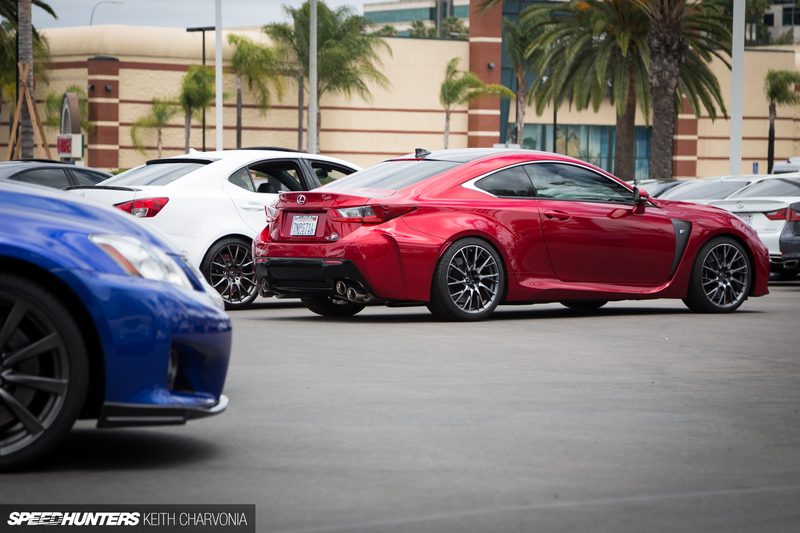 It’s mostly IS Fs that are being modified right now due to age and price, but we spotted some RC Fs at the meet too. Josh of Meraki Autoworks brought out his personal car, which serves as a test bed for the products he sells to the F community. 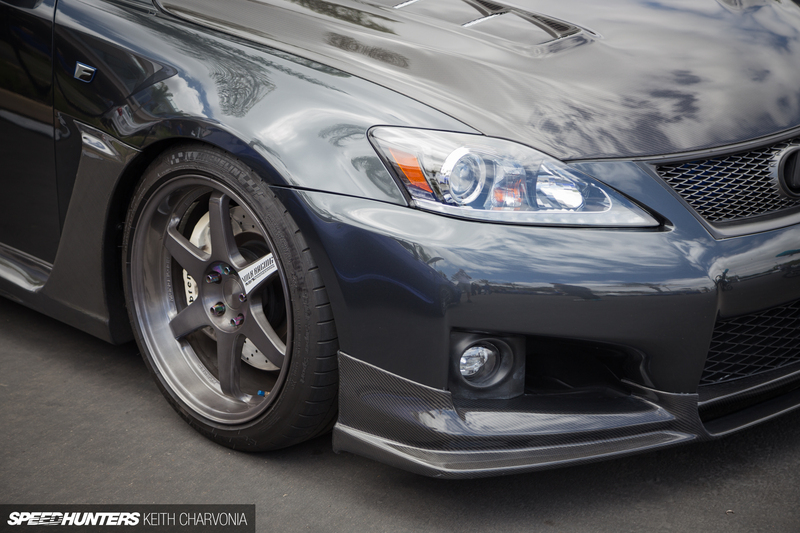 I really liked the RAYS Volk Racing TE37 fitment, since it’s tough to get much front lip on this chassis. Indeed, TE37s are the wheel of choice on this car because they look so damn good, but I’d like to do something a little different to set my car apart from the rest. 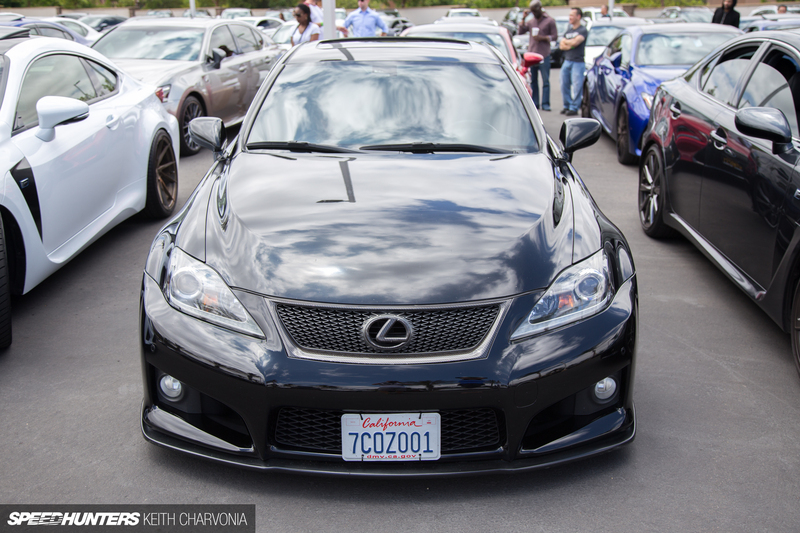 This was probably the most extreme IS F at the meet, sitting on air suspension with matching blue carbon fiber body panels. The TOM’S rear diffuser and Wald spoiler are also very popular mods on these cars. I didn’t have my custom FUJISPD plate made in time, but it seemed like everyone else had something to say with theirs. These throwback black plates have exploded in popularity in California. The owner of this IS F was very cool, taking the time to show me around his car and explain his mods. It had to be the lowest static car there, riding on KW Variant 3s. He also had the updated LED headlights and a simple front lip. Those poor Californians are legally required to run a front plate, yet another reason why I prefer Arizona. 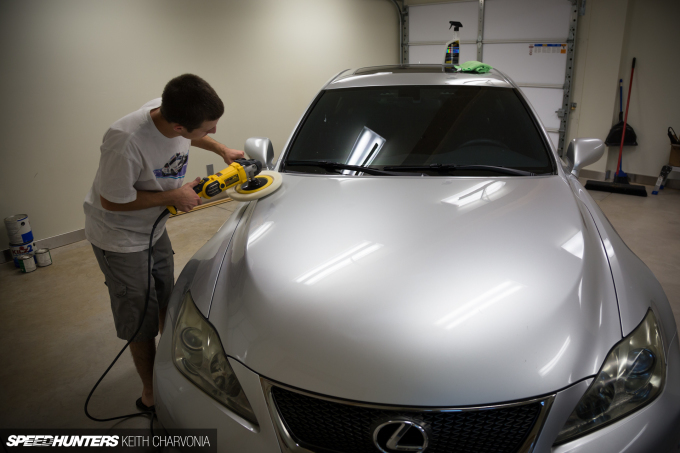 Many IS F owners choose a similar formula when modding their cars. It’s foolproof and almost always guaranteed to look good. But if you want to stand out in a parking lot full of the same car, you have to get creative. That’s why I loved this one, sitting on racy Enkei NT03+Ms. I believe these are 18-inch wheels, a size down from the factory 19s, and looking even tougher with the beefy tires. Wheel selection is tough when your car comes from the factory with forged BBS 19s, which is why I think a lot of guys just leave the stock wheels and focus on other mods. It’s going to be a challenge to fit the right wheels to FujiSpeed. 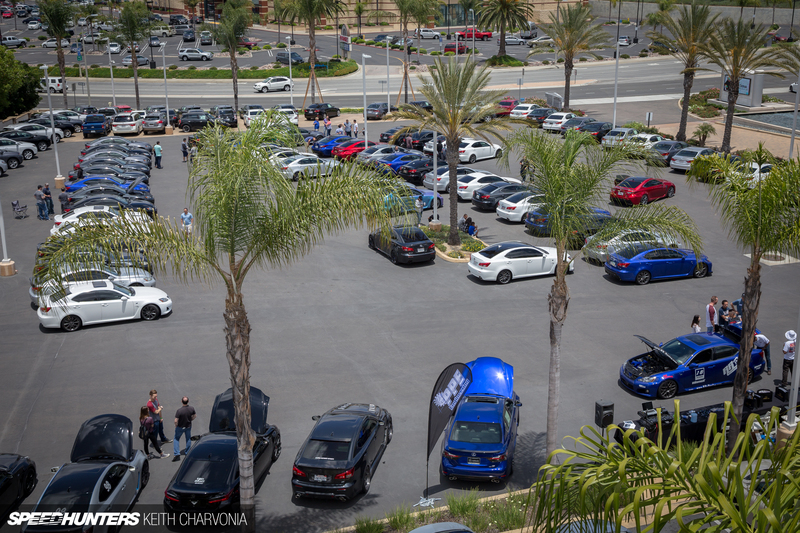 Towards the end of the day I made my way to the roof of Escondido Lexus and realized how shockingly tall a stock Lexus looked after seeing so many that were slammed. It was a good chance to take in the scene. Rumor had it this was the largest gathering of IS Fs ever. 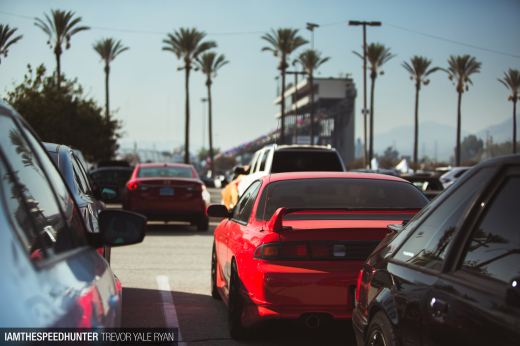 What better way to decide how to mod my car than to spend a day with nearly every IS F owner on the West Coast? So what’s in store for my car? You’ll have to keep an eye out for more Project FujiSpeed stories, coming soon. Awesome car Keith! Those are super hard to come by. I had a 2007 IS250 for a short while before I traded it for my current Challenger. The car had the notorious melting dash and door issue, from what I understand the same material is used on the F cars. Hopefully yours does not experience this but, check out the forums just to make sure. Can't wait to see how your project turns out! 370 Hemi Thanks Alex! I'm aware of the melting issue, it's definitely the worst part of owning these cars. The PO had the dash replaced under warranty, but they wouldn't take care of the door panels. Luckily I've scored a good set that seems to be post-recall so I'm just waiting for the time to install them. 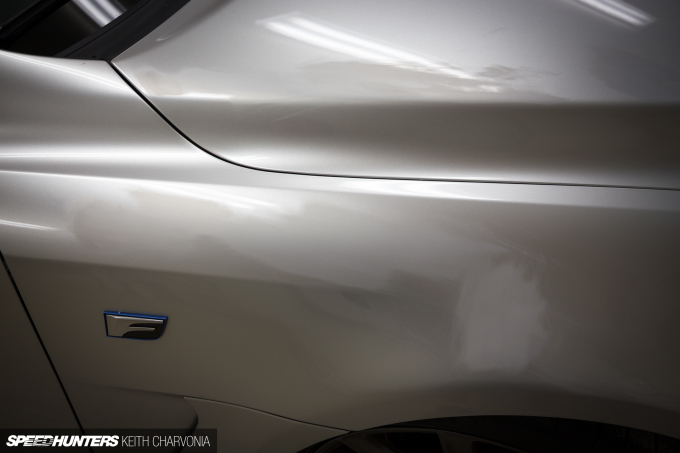 KeithCharvonia I haven't checked to see if anyone has done this but, if you plan on keeping the car long term, maybe a wrap on those new panels would work to keep them from going through the same issue. 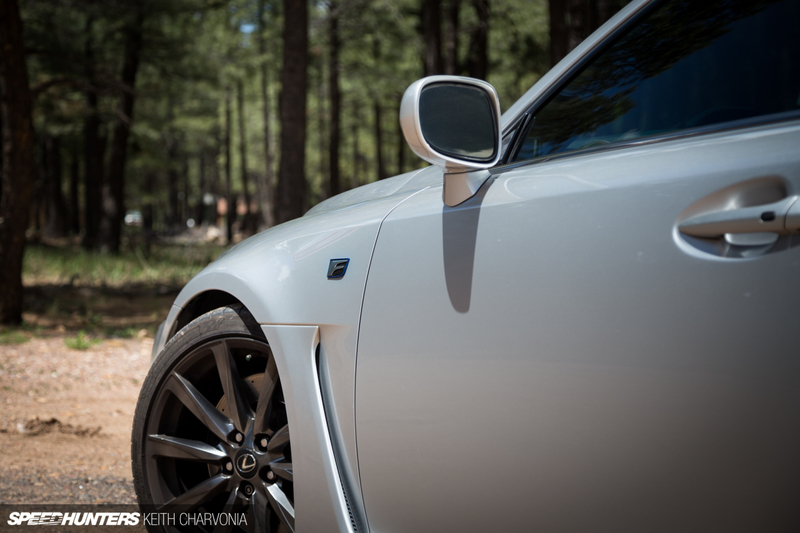 I don't know if Lexus used different materials on the replacement parts, hopefully so. andyb5 I have, but thanks to your link I found a couple stories that I somehow missed. Thanks! 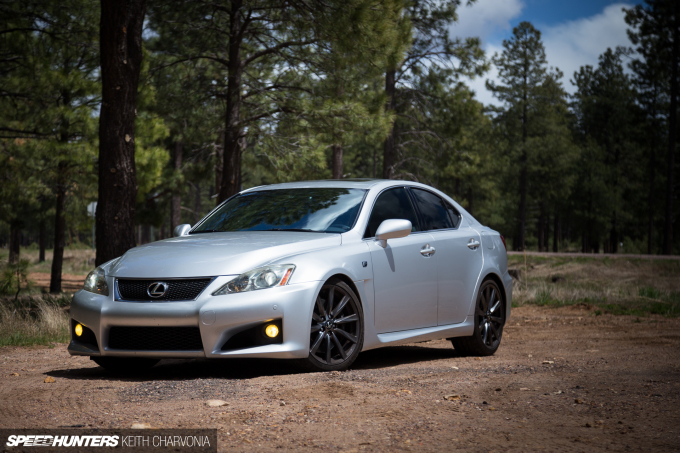 The IS-F is a strange beast, something that I don't even think Lexus really understood. It stands along side Chevy's SS, a car whose appearance really hides it's potential. The first time I saw the IS-F was at one of the LA Auto Shows. Lexus was offering people rides in the IS-F... on a dyno. They wanted to show off the car's transmission and rev limit. Bizarre. Eventually the IS-F will be known as the hidden gem it truly is. Hopefully you can hold on to yours long enough for that to happen. I'd suggest going with the 18s over the factory 19s, does a huge difference for more profile. To be honest, I was pretty skeptic on how I was going to feel on this. I really don't have much interest in Lexus design cues, especially the direction they are headed these days. And while also being unfamiliar with every one of their models, this one really has very interesting lines that tie together nicely. Looking forward to where you go with this project, Keith! 18" black or silver RPF1 with beefy tires would look reaaally nice. What's up with the door panels ? JeanLuc Cartwright Nice! We just put H&R spacers and ISF wheels on my brothers IS350 too. Widening the stance really makes these cars look good. Bigniks Sweet car. I was seriously looking at the GS as well. Ah the old sport cross needle in a haystack game. I. Played that one too. I'll be following this build like all your others, look forward to it. 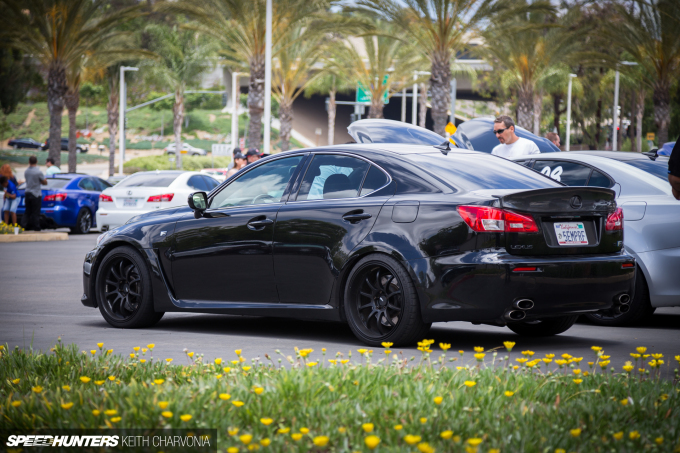 KeithCharvonia I think I saw a picture of the IS350 on ISF wheels floating around Instragram recently - Looks great! 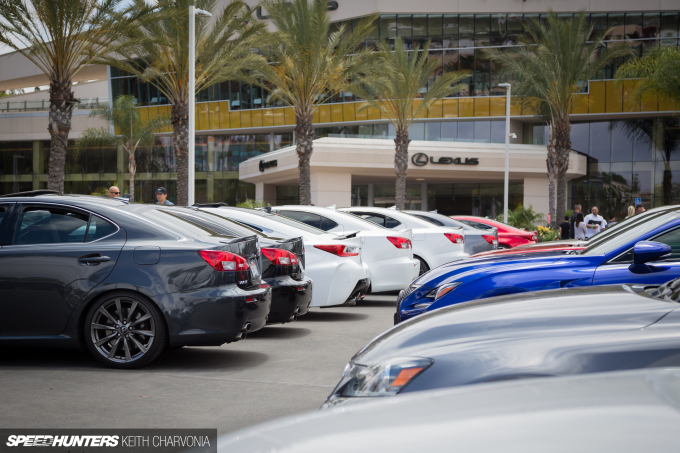 That Lexus dealership is like 1 mile from my house! Fantastic food in the restaurant on top of the building. 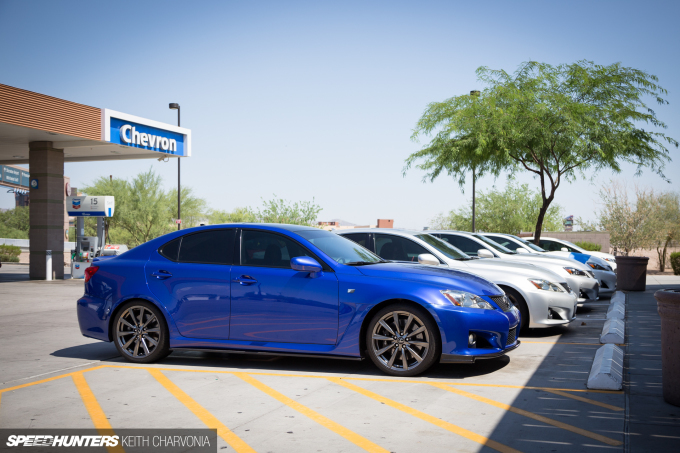 LukeEVOVIII ZE40s look great on these cars but I already had them on my FR-S. Time for something new. D1RGE We didn't get to eat there but I noticed the Yelp reviews were good. Next time! TravisBlair Other way around. Win! EvolveWRC It feels like a lot more car despite being four years older. DaveT Ha! We have very similar tastes. One day I think I'll still own one...with a turbo of course. Did you get a chance to check out RR-Racing's supercharged beast? until I looked at the check which said $9854 , I have faith ...that...my best friend was like they say trully earning money part-time at there labtop. . there aunt haz done this for only seventeen months and at present repayed the morgage on their home and bought a top of the range Citroën 2CV . In my opinion, you definitely made a change for the better! About the mods... have you thought about maybe a color change? 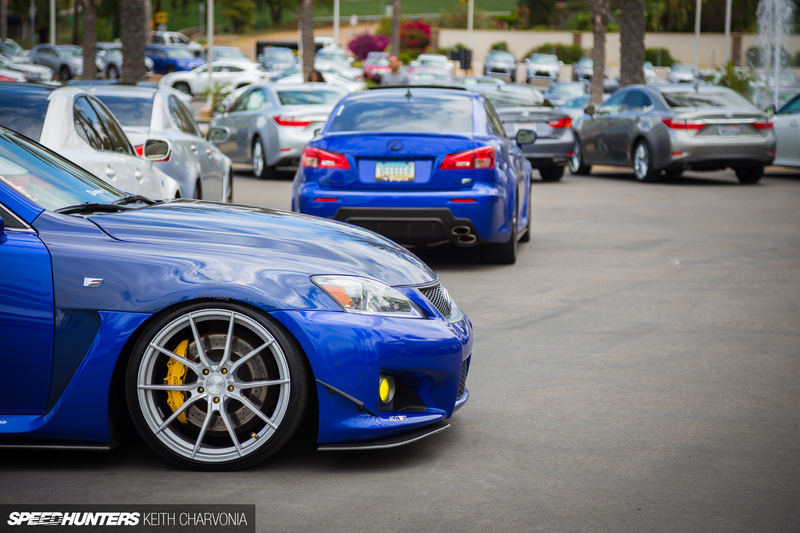 KeithCharvonia EvolveWRC These cars just can't look old, take a look at the first Lexus IS, 17 years old by now and still looking fresh! 370 Hemi KeithCharvonia It's from the weird rubber coating that Lexus puts on the dash/doors. 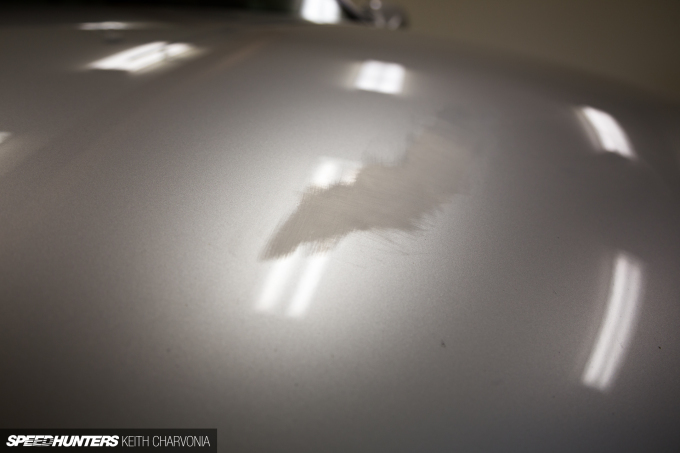 It does melt from the heat and causes rough spots when rubbed. The best fix I've seen is to remove the dash from the car and sand off all of the rubber. Paint it black (or whatever color your interior is) and you will never have the problem again. I was born in the hospital in Escondido, grew up a little ways off in Temecula. I'm a sad East-Coaster now though. 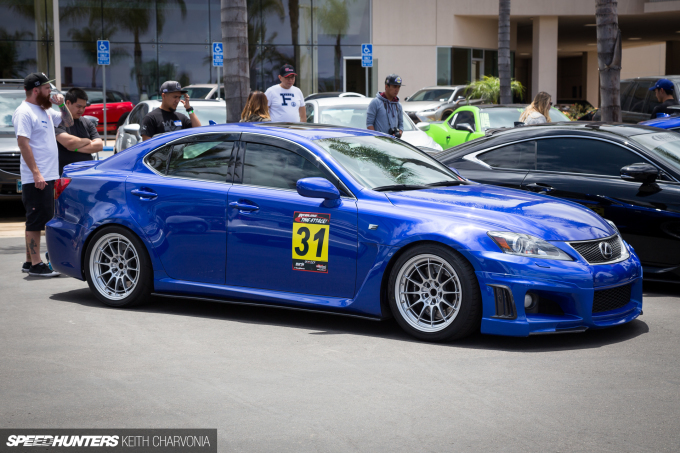 Good job on the trade, but any particular reason you went for this over an IS300? Getting what's essentially a luxury Supra for a third the price just seems too good. "Wheel selection is tough when your car comes from the factory with forged BBS 19s"
And yet so many STI owners put Rotas, XXRs, etc. on their cars. I can definitely see the car sat on some Rotiform multi-spokes.